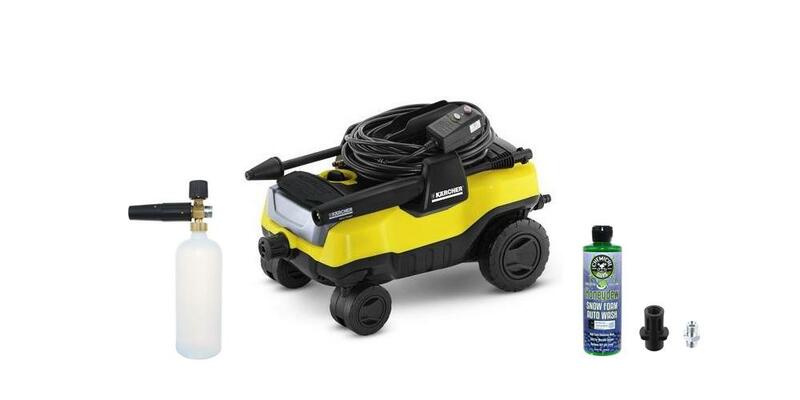 We have hand picked each item in the Karcher Pressure Washer and Foam Lance Kit because they are highly effective when paired together. To create the best kit possible we utilize our years of detailing experience, combined with input from some of the best detailers around the country. We are confident you will get outstanding results with each item and really enjoy how your vehicle looks afterward. Save $32.96 off of the retail price of individually purchasing these items! Karcher Follow Me Electric Pressure Washer - powerful, compact and convenient pressure washer! DI Accessories 1.1 MM Orifice for Low Pressure Washers - increase water flow and get more foam! One word to describe this would be AWESOME, the foam cannon lays down a thick blanket of foam just like in the video. I followed the instructions on the bottle of honey dew from chemical guys and used warm water to fill the bottle. The pressure washer is perfect for washing cars and general cleaning around the house. I've only had it a couple of days so can't comment on reliability, but overall the construction seems to be good. My only gripe is I wish DI had included a small piece of Teflon tape for the Karcher conversion kit to use the foam lance. The front wheels are kinda hard to get seated, the metal part that goes into the frame looked like it had some corrosion on it already which I thought was weird. But overall pleased so far, I'll update in a couple of months if I find fault with this.